Open your .blend file and select "Scene" tab inside Property Window. Choose "Metric" and input "0.01" to display "cm" unit for measurement. Click the "Grease Pencil" tab inside Tool Panel and then select "Ruler/Protractor" to activate the ruler tool. LMB to drag directly inside 3D viewport to measure your geometry. Goto Blender's "User Preferences" and check "Mesh: 3D Print Toolbox" to insert this add-on to Blender. The "3D Printing" tab be added in the Tool Panel. In "Edit Mode", highlight all vertices first, then use "Remove Doubles" feature to eliminate all duplicated vertices. Remain in "Edit Mode", un-selet all vertices. 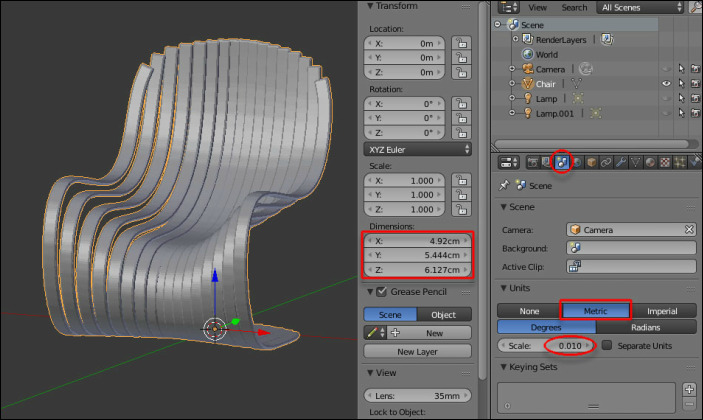 Press "Shift+Ctrl+Alt M" keys together to call the feature and Blender would highlight all the non-watertight edges if the scene has any "non-manifold" parts (alike the circled part on the image). Check the non-manifold again till the geometry is watertight and fulfill the thickness criteria. You can use Blender's "3D Printing Toolbox" features to double check your geometry. Make sure your model is a "printable" one. You can also check on it's volume and other information. Once the geometry is fine. Use the export feature to convert your .blend geometry to a printable .STL file format. Before submitting your .STL to my colleague, pls double check it's ready for print or it might delay your output process. *Pls. follow my colleague's instruction to submit your .stl file before deadline!! Get your final Design ready. Export to .stl and submit before deadline. You can download my "imake07_chair.stl" to study it's topology. We will do a 'turntable sequence' in next workshop to prepare for your presentation.